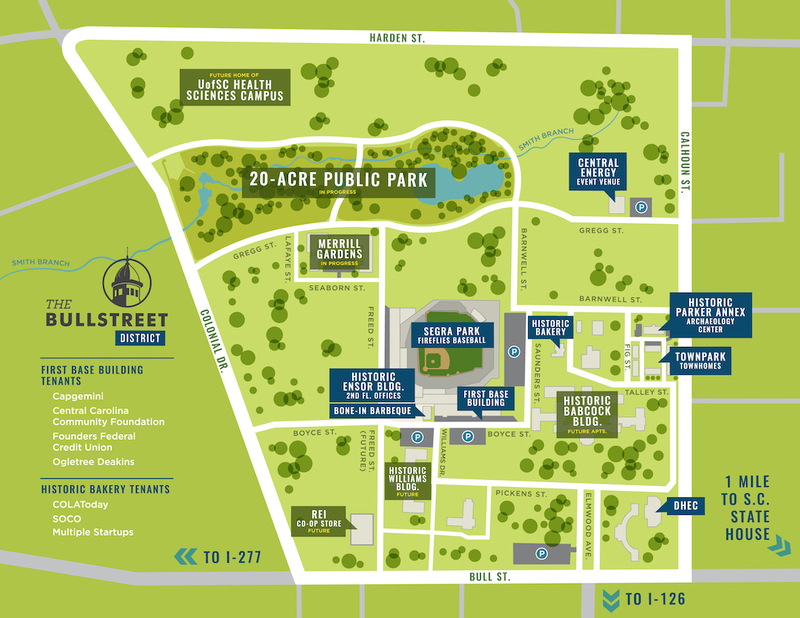 There are many changes happening throughout the BullStreet District in Spring 2019, from the recent announcement of REI, a national retailer known for quality outdoor gear, to construction continuing on the Merrill Gardens active senior community, to the upcoming 20-acre public park. 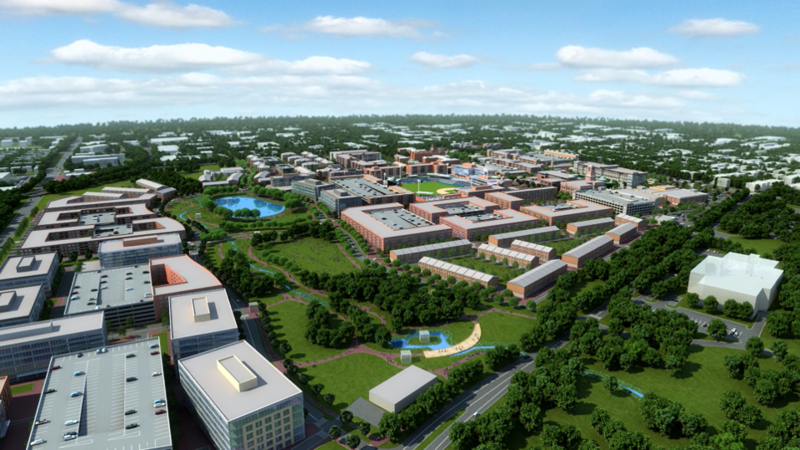 All of this development is being completed with sustainability in mind. More than 90 new trees have been planted across the BullStreet District to date, with more being planned as progress continues across what is known as the largest urban redevelopment project on the East Coast. 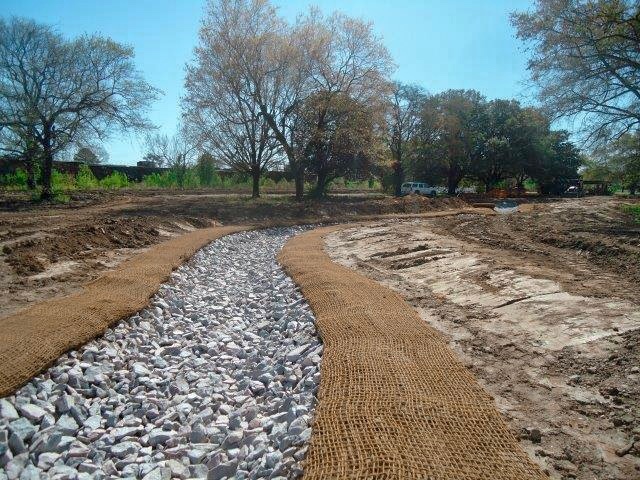 In the 20-acre public park being designed by Beau Welling Design, more than 3,500 live tree stakes are being planted for erosion control along the restored Smith Branch Creek. Robinson Design Engineers completed design work for the 1,000 linear feet of Smith Branch Creek that has already been restored, while work continues to daylight 2,000 linear feet that currently runs through the BullStreet District in underground pipes. Many of the plantings in this area will grow into new trees alongside the restored creek and 2-acre pond, around which walking trails are under construction. Work continues to daylight Smith Branch Creek. Buffer zones and wetland meadow areas with native grasses are being replanted and restored along the stream corridor as well. The park also preserves at least a dozen mature oaks and multiple picnic shelters. All site planning inside the BullStreet District has taken into account the location of healthy, heritage trees and pushed development in the location of unhealthy, dangerous trees. 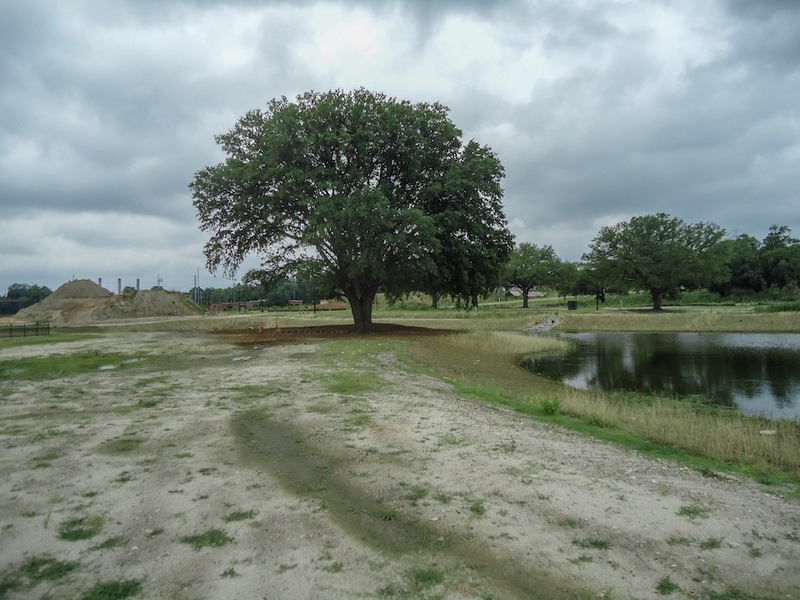 One example where plans were changed to preserve a healthy tree is the picturesque live oak located in the middle of the park’s pond. Originally slated to be an oval pond, plans were redesigned to create a peninsula where this stately oak tree can thrive. Special considerations have also been made to ensure the oak’s survival as fertilizing programs have been implemented, as well as mulching and irrigation with concentric circles of watering hoses for months. These efforts were recognized by the City of Columbia’s “Treasured Trees” program in 2018. The oak tree in the 20-acre public park where an oval pond was originally planned. Phase one of the park, including a dog park, is slated for completion later this year. As the district continues to grow, additional phases will incorporate features such as playgrounds and public art based on how the park is being used. Renderings for the 20-acre public park. Meanwhile, crews with C. R. Jackson Contractors will begin site preparation work next week for the 20,000 sq. ft. REI Co-Op retail store and associated infrastructure. McCrory Construction will build the store itself. They will join crews already at work on the park and the Merrill Gardens active senior community, for which a topping-out ceremony was held earlier this spring. To allow vertical construction to begin, the site will be graded for the REI store, Boyce Street and to straighten Freed Street in the upcoming weeks. Clearing the land for roads, buildings and parking was approved by the city last week and will require removal a number of large, dead trees, as well as trees deemed to be in either fair or poor condition by licensed arborists. “This is an unfortunate reality for much of the BullStreet site, but we are working hard to retain as many healthy trees as possible and are replanting trees on a regular basis so that the district does not lose its character, which is vital to our New Urbanist vision for this remarkable place,” notes Robert Hughes, president of Hughes Development Corporation, master developer of the BullStreet District. As much as possible, the trees will be recycled throughout the campus either as mulch, finishes, handcrafted furniture or other uses. As part of the removal and reuse process, the BullStreet District is working with an accomplished local woodcrafter, Bricker and Beam, to preserve and repurpose as much of the viable wood as possible for future use at BullStreet. On Saturday, April 6, Bricker and Beam marked every tree that was assessed to be usable for woodworking. The trunks have been sent to a local sawmill where they will be dried and cured, a process which requires at least nine months. The wood will be repurposed into furniture that will be used in the BullStreet District and beyond. Map showing how Freed St. will be straightened. Once site grading work is done, installation of new underground infrastructure to support this latest phase of the project will begin, as well as completion of the new roads and parking areas for REI and the BullStreet District. McCrory will begin vertical store construction in Summer 2019. Like REI and the BullStreet District, McCrory is known for its environmental stewardship. The longtime Columbia construction firm is a leader in site sustainability, reducing the amount of waste going to landfills for its projects. Site construction waste will be managed and divided into clearly identified containers for each type of material such as metals, woods and concrete. The site will also include highly visible recycling containers at entrance and exit points for bottles, cans and other discards. Stay tuned to the district’s Facebook, Instagram and Twitter pages for more updates on the 20-year transformation of #BullStreetSC.